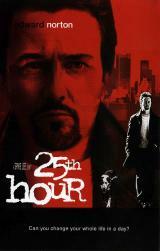 Academy Award nominee Edward Norton heads an amazing all-star cast in the critically acclaimed Spike Lee (Summer of Sam, Do the Right Thing) film 25th HOUR. In 24 short hours, Monty Brogan (Norton) goes to prison for seven long years. Once a king of Manhattan, Monty is about to say goodbye to the life he knew — a life that opened doors to New York's swankest clubs but also alienated him from the people closest to him. In his last day on the outside, Monty tries to reconnect with his father (Brian Cox, The Bourne Identity), and gets together with two old friends, Jacob (Philip Seymour Hoffman, Almost Famous) and Slaughtery (Barry Pepper, The Green Mile). And then there's his girlfriend, Naturelle (Rosario Dawson, Men in Black II), who might (or might not) have been the one who tipped off the cops. Monty's not sure of much these days, but with time running out, there are choices to be made as he struggles to redeem himself in the 25th hour.